Cheers tap heads! The gentlemen are here to get your beer adventure underway. 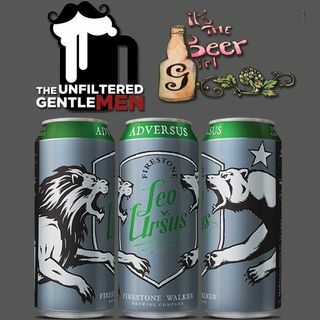 They're drinking and reviewing Firestone Walker's Adversus, part of the Leo V Ursus series from the Central Coast brewery. Dale aka It's The Beer Girl is back and she's telling us all about a delicious North Carolina brewery; Blue Ghost Brewing Company's Mango IPA. The bullpen beer was Greg's home-brewed IPA, a delicious Blind Pig clone. There's a rousing round of What Does Dan Know ... Más informaciones and Scott has a baseball rant that will have the fans on his side. In Booze News: Fulton Brewing is expanding distribution, it's time for pumpkin beer to come back, Ninkasi Brewing will start canning, Carnival Cruise Line has an on-board brewery, and so much more! The Beer Babe of the Week is @Nails.on.the.Rocks, make sure to follow her on Instagram. Old Timey Word of the Week: “I have to go see a man about a dog”. Use it in a sentence on social medias for a shout out! Make sure to get our Beer Science ringtone, search the iTunes store or tuunes.co. And don't forget to check us out at www.theunfilteredgentlemen.com, www.facebook.com/unfilteredgentlemen, @unfilteredgents on twitter and TheUnfilteredGentlemen on Instagram! We want you to drunk dial (805) 538-BEER (2337), we'd love to hear from you!